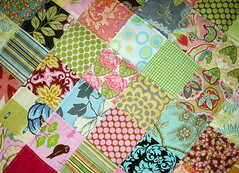 The fabrics for this quilt were chosen and arranged by C. She has good taste, don't you think? 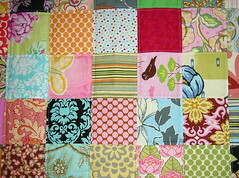 Most of the squares are from an Amy Butler charm pack I ordered from Fat Quarter Shop. Somehow, even though the picture on the package is clear as day and it says Lotus right on it, it wasn't what I wanted. I actually wanted the Belle line. I had set the charm pack aside with no plans for it at all (actually I bought two ... but what's the point of mentioning that!). C. found it, opened it, and we both fell in love. Square after square became our "favorite". The colors and patterns are beautiful. 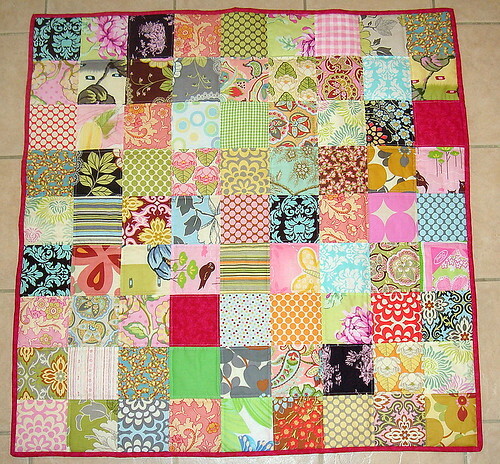 I'm thinking of using the remainder of the first pack and the second pack (and probably supplement with some more) to do new quilts for the girls room, something like this. 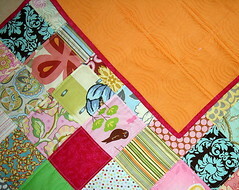 This quilt came out especially colorful, loud even, but I think that's part of the joy of it. Once it was on the floor in the pattern she thought she wanted C. got ready to move pieces around to balance the colors, patterns, etc. I told her to stop and just leave it the way it was, I loved that it's not exact ... there are blues next to each other and not evenly spread out, there are dots next to each other (she did do that on purpose), and so on and it just seemed to make it more "right" by not being quite right, if that makes sense. The backside is a soft orange and the binding is reddish with pink flowers. 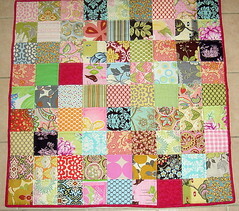 It's another small quilt, measuring about 42" by 42". I think I may be done sewing for the day, at least. We've gotten two of the kids rooms cleaned (the girls was yesterday ... 13 trash bags full of stuff to Ditto Kiddo) and have one left to do, and M. has a cold she's being kind enough to share with me. C.'s hand is healing well. The stitches should come out in another week, but she's had incredibly limited pain and isn't slowed down by the injury at all. Thanks. I love the bold colors...and when do you have time to get all this done woman!! You're amazing. I spy some Heather Bailey in there too...but what is the fabric that has a bird on with three little stalky leaves? Thank you Beth, Jennifer, and Florence! Is it this one? http://www.sewmamasew.com/ccp0-prodshow/RKOWLP.html It also comes in mustard and blue. Cheerful and jazzy, I love it to pieces! Hmmmmmm. I love Amy Butler fabrics and patterns. This is wonderful. It is beautiful! Very good job, C! !